The state is the first in the nation to legalize recreational marijuana. NBC's Gabe Gutierrez reports. Colorado's legal recreational marijuana industry kicked off Wednesday with an Iraq war veteran who suffers from post-traumatic stress disorder making the first pot purchase under the new law. Sean Azzariti of Denver, who helped campaign for Amendment 64, bought an eighth of an ounce of a strain called Bubba Kush and a pot-infused edible truffle for $59 at the 3D Cannabis Center — one of two dozen retailers that began selling up to an ounce of weed to adults starting at 8 a.m. mountain time. "It's pretty surreal," the cashier told Azzariti, who was not able to buy medical marijuana with his diagnosis. "Thank you so much," he said as he accepted the package and held up his receipt for a phalanx of television cameras at the carefully choreographed inaugural sale. "I feel amazing. This is a huge step forward for veterans," he said. "Now I get to use recreational cannabis to alleviate my PTSD." The countdown to the first sale began New Year's Eve with "Prohibition is Over" parties where enthusiasts clutched bongs instead of champagne flutes. By morning, there were lines in front of some retail shops in the eight towns where the new industry was up and running. "We wanted to be a part of this movement," Brandon Harris, who drove 20 hours from Blanchester, Ohio, told the Associated Press outside one Denver store. "We're making history here." Jacob Elliott, of Leesburg, Va., was out before dawn. A veteran, who says he suffers from PTSD, was first in line to buy marijuana at a Colorado store. The state is the first in the country to allow the sale of recreational marijuana. "This breaks that barrier," he said. "We can buy it like any other free-market product." Colorado residents age 21 and over can buy up to an ounce under the new regulations; non-residents can purchase up to a quarter-ounce. Addison Morris, owner of Rocky Mountain Mile High Tours, chauffered 10 out-of-state clients to a dispensary, where a "marijuana concierge" helped them choose their pot — for a $295 fee. "We're your grandmother's pot connection," Morris, 63, told the AP. "We're not the hippie stoners who are going to stand in this cold and party." Despite the ease of purchasing it, smoking marijuana in many public places is still illegal, as is driving under the influence. Marijuana advocates said they expect $400 million in sales in the next year, giving the state an economic boost. Mason Tvert, co-director of the legalization campaign, said he expects several other states to follow suit in the next few years. 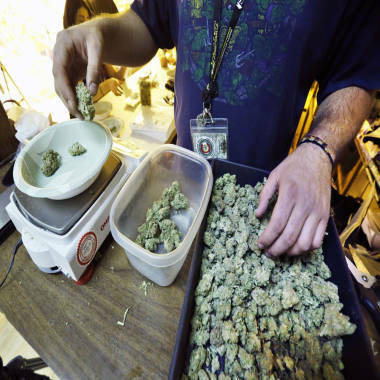 An employee weighs portions of retail marijuana to be packaged and sold at 3D Cannabis Center in Denver, Tuesday Dec. 31, 2013. "Regulating marijuana works," Tvert said, pointing to the state's longstanding medical marijuana operation. Pot activists say a government-monitored marijuana industry is a better alternative to the drug war and no different than how alcohol is treated in the United States. Critics worry that it will fuel drug abuse and use by minors.